3 Masters (3 w/K), 1 w/2 Bunk Sets, 1 w/Pyramid & Trundle, 1 w/2 Twins. Sheets, Towels/Bath Mats, Beds Made. Bring the whole family and the family dog too! This six bedroom Oceanside home in Ocean Sands is beautifully decorated with modern, comfortable furnishings. Surfin' Paws features flat screen TVs in each bedroom and game room, a large HDTV with DVD in the great room, and a large Smart HDTV in the game room. All TVs have cable, except where specifically noted below. Sheets, Towels & Bath Mats provided. Unlimited long distance calls. Stylish, bamboo hardwood floors are throughout the common areas on the top level. You will feel right at home at Surfin' Paws! 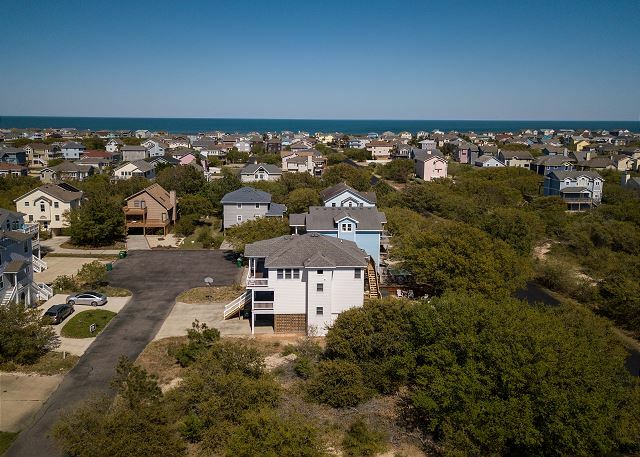 Enjoy the 12 x 24 gated private pool and hot tub or grab the beach cart and take a short walk to the beautiful Corolla beach (Approx. 500 yards). A large dog crate is provided. Surfin' Paws is located in the beautiful Corolla community of Ocean Sands, convenient to many wonderful restaurants and shops. Less than one mile to grocery store, Harris Teeter and golfing at the Currituck Club. If you are seeking attractions, you are minutes away from the Currituck Lighthouse and The Whalehead Club. Up for adventure? Try a 4x4 Wild Horse Tour of Carova Beach just a few miles north! Outside: Covered Parking. Pool and Hot Tub, Outdoor Shower, 2 Charcoal Grills. Lower Level: Rec Room w/Pool Table, Flat Screen TV/ DVD, Stereo w/CD and iPod Dock, Wet Bar w/Refrigerator, Microwave. Laundry Room., Bedroom w/Pyramid Bunk and Trundle (Netflix/Smart TV only), Full Bath. Mid Level: King Master, King Master Master, Bedroom w/Twins (Netflix/Smart TV only), Bedroom w/2 Bunk Sets (Netflix/Smart TV only), Full Hall Bath. Upper Level: King Master, Living Area w/Large Flat Screen HDTV/DVD and iPod Dock, Dining Area w/Seating for 10, Kitchen w/2 Dishwashers, Microwave, Breakfast Bar w/Seating for 3, Table w/Seating for 4, Half Bath. This was a great house and very spacious. It had plenty of pots, pans, and dishes. It is very close to shopping and grocery stores. It was not a short walk to the beach we had a lot to carry that was the only inconvenience but other than that it was great! From the Lighty’s from TN. We had our two sons and daughter and family for a whole week at surfin paws. We like the Corolla location because it is away from the crowded area but at the beach and access to to many things around. The house at surfin paws is wonderful. It met the needs of was clean when we arrived, everything worked in the house. Very very very nice. The staff was so helpful. Thank you so much for taking the time to leave a review! We are happy you enjoyed your stay and that we were able to address any concerns in a timely manner. Come back soon! THIS HOUSE WAS AMAZING CLEAN, PERFECT WALK TO THE BEACH. NICE AREA TO WALK AND RIDE BIKES, PRIVATE. A THREE MINUTE DRIVE TO GROCERY STORE AND SHOPPING, VERY CONVINENT FOR EVERYTHING. wE DON'T RENT THE SAME HOUSE EVERY YEAR BUT IF WE DID THIS WOULD BE IT. Thank you for sharing your experience with us. We are thrilled you enjoyed your stay with us. We hope that you and your family visit us again in 2019! We had such a wonderful time here! The owner was excellent in responding when there was a small concern over cleaning. Wasn’t enough to make us never stay again. We went 4th of July week so trying to go through Duck and get south was longer than normal. It was nice and “quiet” in Corolla. There was 10 of us and was nice to be able to “spread out” and not feel we were on top of each other. Kitchen well stocked with utensils/plates/small appliances. The kids and adults absolutely loved hanging around the pool in the evenings! Thank you for your feedback! We hope to see you again soon! We loved the house that we stayed inn. We had plenty of room for everyone. Out kids enjoyed the pool so much. The wall to the beach was fast and easy. So glad to hear your family enjoyed their time at Agua Azul (now Surfin' Paws). We hope you'll return for another memorable stay. I would stay here again and again!! This rental house was perfect! It is about a 7 minute walk to the beach and a 15 minute walk to the little shops. The house had everything we needed from 2 coffee makers and a Keurig to a griddle and plenty of plates, bowls and silverware. The layout of the house was nice and the pool area was great. It was nice to step outside in the back of the house and have some privacy from the neighbors. My family and I will definitely be back.. well at least I can hope. House was very accommodating only thing I would suggest is allowing the top floor bedroom to have a closet to use instead of it being a locked owners closet . The room is very cramped as it is with a large bed and one side is crammed against a wall. Luckily we are thin. I think it has one too many dressers in there and the room could be more spacious with one less. Frying pans need replacing we ended up buying one to use, But the pool and home were perfect otherwise ! Thank you so much for taking the time to leave feedback for Surfin' Paws. You are in luck! The owner heard your feedback and made swift changes to ensure that your next visit will be as close to perfect as possible. For 2018, guests will have use of the top level King master bedroom walk in closet. Again, we appreciate your feedback and allowing us the chance to make the home just a little more accommodating for your family! Except for the long trek to and from the beach the location was adequate. The dining facilities that we used were on the expensive side. Overall it was a pleasant stay. This house was perfect for our trip to the beach. We had two families with 8 kids. Every kid had a bed and there was plenty of room to spread out! The house was clean. We loved the hardwood floors. We did not bring our dog, but would consider it on our next visit. We did not love Corolla due to the amount of traffic, and the distance we had to drive to get anywhere. The days we chose to just stay at the house, it was fine. That being said, the beach was very busy during our stay. I would either not visit in August again, or choose to stay closer to Duck. Thank you so much for taking the time to leave a review! We are so fortunate to have such a wonderful team here at Beach Realty and we look forward to hosting you and your family again soon! We were very pleased with the layout and house that we choose. 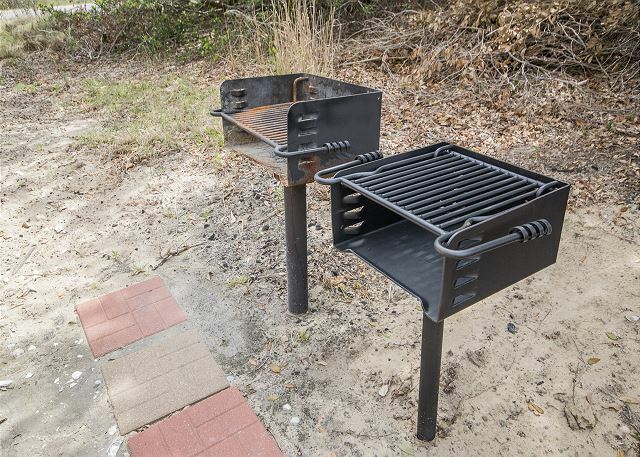 A few things that would make vacation a little smoother would be providing beach equipment and a crockpot for cooking. We loved the location in regards to closeness to grocery stores and things to do. I would recommend the wild horse adventure tour..we all enjoyed it. Thank you for your feedback, and suggestions for improvements. We hope to see you again soon! It has everything you could want. A very stocked kitchen and when the blender didn't work they sent me a new one! Agua Azul (now Surfin' Paws) is a great home. Glad we were able to service you promptly. We hope to have you back next year!